By contrast, Jeff Lynne’s writing was more acutely focussed around the John/Paul axis than Roy’s. His Beatles mimicry was more accurate, but lacking the commercial clout. The connections between the two groups goes further. It extends back to Idle Race’s debut vinyl project, a version of Roy Wood’s “Here We Go Round The Lemon Tree”. 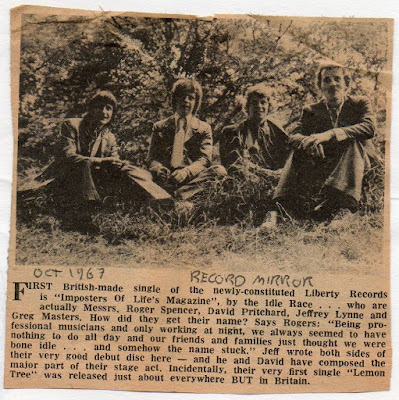 It was hastily withdrawn by Liberty – in the UK at least, when the Move’s own recording of the song, hidden on the ‘B’-side of “Flowers In the Rain” began picking up heavy airplay. So subsequently Jeff’s own compositions took precedence. “Imposters Of Life’s Magazine” (October 1967) is a charming sub-psychedelic 45-rpm cameo, with strong inventive hooks, laser-focused harmonies, vocal interplay, and clever lyrics. It was the first time Jeff’s name ever appeared on a record label, which amplified the irony that they’d spelled his writer-credit as ‘G Lynn’. What’s “Imposters…” all about? Well, ‘Life’ magazine obviously, as in the newsstand journal, but there’s also life’s magazine, in the ‘Book Of Love’ sense of ‘your name is written there’. This means that some people’s life-style choices make them less authentic than others, hence becoming ‘imposters’ who find ‘your name from their memory has gone’. Weird stuff. But the new Radio One liked it. Kenny Everett even proclaimed them ‘second only to the Beatles’. 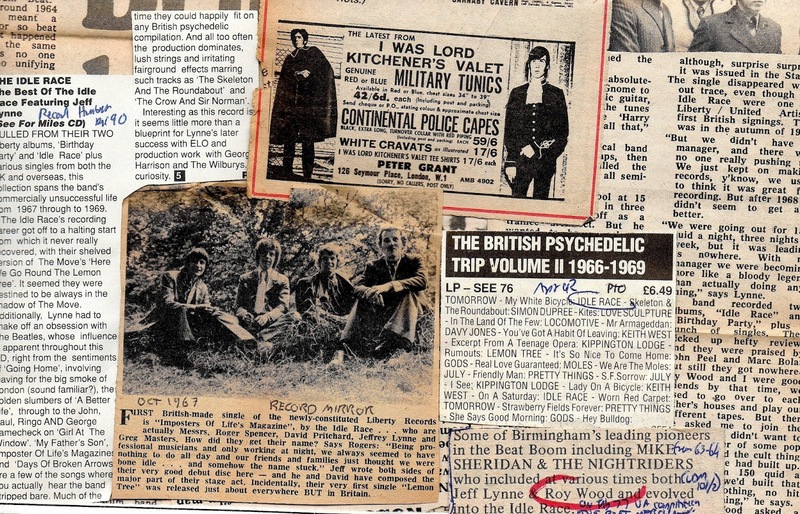 Then “Skeleton And The Roundabout” (February 1968) is a class single for its moment with a contagious hook, but it never quite surmounts its influences to become more than a whimsical curio. An odd narrative, in tells of a fairground roundabout operator whose business is so slow he can’t afford to eat and becomes so thin he joins the Ghost Train, hanging ‘from this gate’ as a ‘skellington’, he now earns so much he eats and becomes ‘too fat to be a ghost’, gets fired and winds up back at his roundabout again! 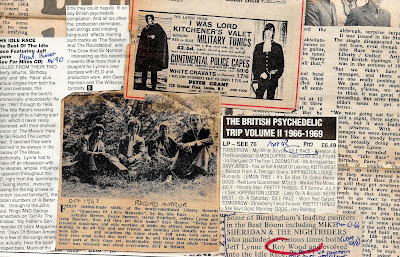 An endearing oddity of a tale, and, although a period miniature – when re-issued as a single in 1976 ‘NME’ still thought highly of it, commending its ‘weirdness’. Both Lynne and Wood had kick-started their careers by serving time as part of Mike Sheridan’s Nightriders – a seminal Birmingham post-BeatBoom five-piece whose highly-collectable Edsel LP preserves their singles “Please Mr Postman” and “Brand New Cadillac” (Edsel ED 120). Roy Wood was the first to quit, for Move. 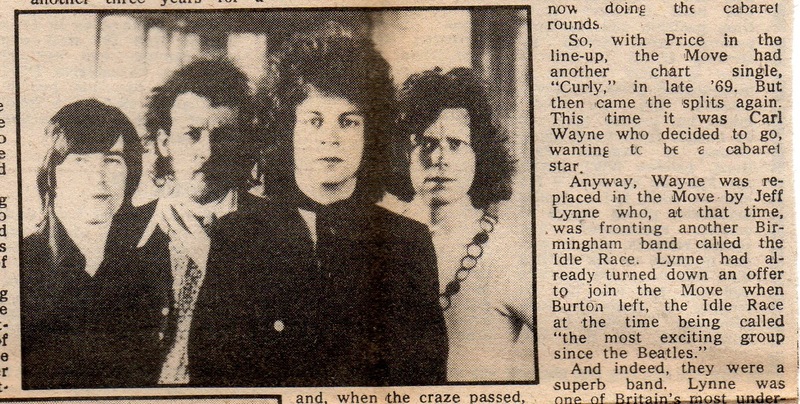 Jeff Lynne replaced Sheridan in time for the Nightriders to mutate into the Idle Race – a group Wood once described as becoming ‘semi-famous’. 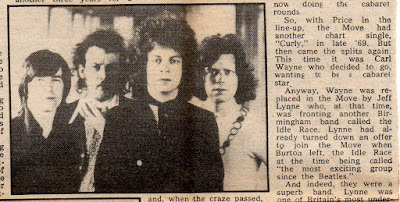 With their reputation on the up-tick they cut two albums for Liberty – ‘The Birthday Party’ (October 1968), cut at the Advision Studios with producer Eddie Offord, and ‘Idle Race’ (November 1969). 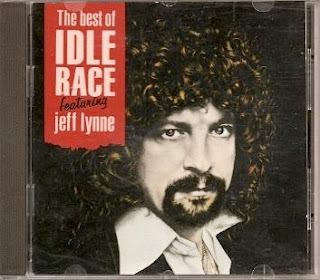 The See For Miles ‘Best Of The Idle Race Featuring Jeff Lynne’ compilation-CD is composed of tracks plundered from both albums. 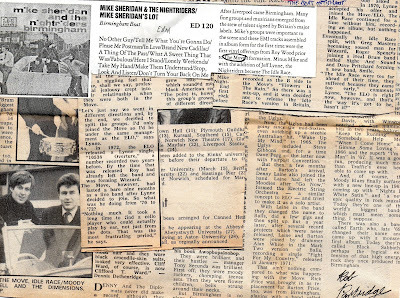 Artefacts such as “Days Of Broken Arrows” (from April 1969) and “Girl At The Window” which paints ‘John and Paul and George and Ringo… playing lovely tunes, from the window of her room’ like an identikit Swinging London movie sequence. So why didn’t Idle Race happen? Why was this one race that Jeff Lynne lost? Perhaps the records were too clever? Perhaps, despite it all, there’s no clearly identifiable unique selling point? 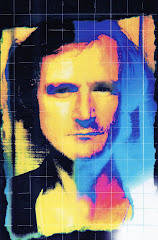 It’s tempting to suggest that Lynne found his signature sound in the strings of ELO, which allowed him to ease off the dense concentration of ideas compressed into the Idle Race records. As the Move began to fall apart, with Wood pushed reluctantly into a front-man role he felt unsuited to, Jeff Lynne was drafted in to shore up and rejuvenate the ailing band leaving Idle Race to die. Cod-metal hit singles like “Brontosaurus”, Wood’s one miscalculation – “Wild Tiger Woman” (which lifts its chorus from “Days Of Broken Arrows”), and ten-minute ‘progressive’ jams like “Feel Too Good” followed, but it’s the sly classical overtones to “Cherry Blossom Clinic” which points the direction it would all lead to… ELO, Wizzard, and the Wilburys. In the seventies their eclectic magpie Pop would be amplified to global proportions, but would remain essentially music from chameleons.